Lords and ladies, knights and bishops, merchants and minstrels – the 2017 Abbey Medieval Festival will be opening its gates to the Castle Arena once again this year to transport you all back through history to the Middle Ages. Proudly sponsored by Brisbane Kids, the Abbey Medieval Festival in Moreton Bay Region is a truly unique experience for all. With archery, jousting, medieval dancing, banquets plus much more, the festival has plenty of fun medieval activities and experiences that will be enjoyed by adults and kids alike. For families with young squires and fair maidens, there will be a Kids Dig It! Medieval Family Fun Week prior to the main festival to help you get into the medieval spirit early. So, don your finest medieval armour, gowns, tunics and cloaks and get ready to see the medieval era come back to life this June and July! 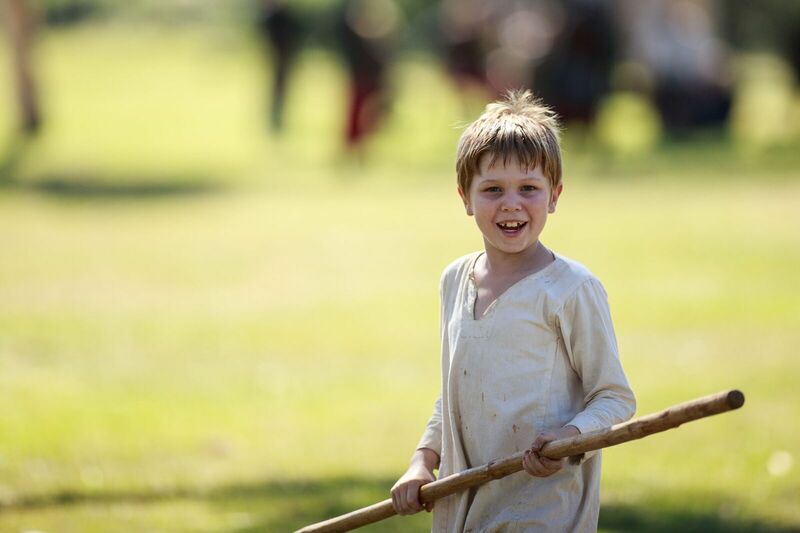 We’ve also scribed some of the fantastic medieval experiences and festival details you need to know about below to help you make the most of your kids’ Abbey experience! The Kids Dig It! Medieval Family Fun Week is the ideal way for kids to get into the medieval spirit early. From June 26 – June 30 2017, the Abbey Museum will have a whole range of fun activities on offer for your young ones to partake in. From 10am – 3pm (gates open at 9:30am), the kids can go on an archaeology dig to search for medieval treasure, create a stained-glass window or a medieval castle, practice their archery or give mask decorating and manuscript writing a try! For the bigger kids, the Archery Skirmish is a highlight of the week and will be happening on Wednesday 28 June. For an extra $10, this is a great activity for kids 12 years and older. You can make your kids Abbey experience feel even more authentic by dressing them up in their finest medieval attire each day. Got a historically accurate costume that you’ve been dying to show off? Why not enter into the Costume Competition and go into the draw to win a prize. If your little ones don’t have shining armour or a medieval tunic and cloak to wear, don’t worry! Medieval dress ups will be taking place at the event each day until 3pm. For $2 the kids can also make themselves a crown or princess hat so they can wander around feeling like a prince or princess for the remainder of the day. If they’d prefer to carry a shield around the grounds instead, take them to along to the event so they can have a go at painting their very own knightly shield for just $4! Not sure where to take the kids first? 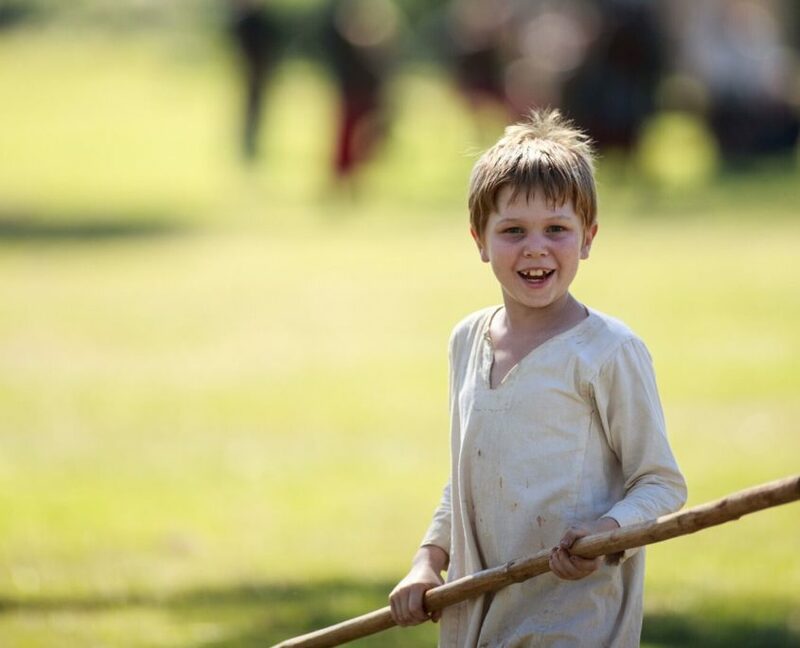 With so many shows and activities to choose from during the Abbey Medieval Festival, we thought we’d help make things easier by giving you a general itinerary guide to help your kids have the most memorable Abbey experience. Begin both days by taking the kids to the Castle Arena for the Grande Parade which starts at 9:30am. Full of exciting and colourful performances, watching this parade should definitely be on the top of your kids must-do list! Let the kids spend the remainder of each morning learning how to Medieval dance or do Fingerloop braiding, take them along to participate in Vikings Games, or relax by watching the Birds of Prey and Abbey Medieval Festival House Troupe shows. From midday onwards make sure the kids are at the Joust Arena so they can watch the amazing jousting performances – it is certainly the best place to be and watching the jousting will likely be the highlight of their day! In the afternoon try some delicious medieval-themed food or visit the Abbey Café with the kids for some afternoon tea to help them re-energise before they finish their day off at Abbey Medieval Festival with some archery. And this year for tweens and teens, don’t overlook the Archery Skirmish – a definite to get them off the couches and away for their screens. For more itinerary suggestions and activity times, click here. Looking for more kid friendly activities in June and July? Head over to the Brisbane Kids website for your official guide to child-friendly activities in Brisbane. Archery Skirmish! This will get them away from their screens! Medieval Archery – with a modern twist! Archery has been a tool and skill humans have been using since the Stone Age. By the Middle Ages it was extremely important for all men to be practiced in archery. This is shown by a Law passed in England in 1252 stating that all men aged between 15 and 60 must have a bow and arrows of their own. And not only in England, who remembers the story of William Tell! While archery may not be the force (pardon the pun) today as it was back then, what child (big and little) doesn’t want to have a go. And if I was a betting person I’d wager there may even be subliminal Physics Class lurking in the background too! Parents, think of this as hands-on-learning. Don’t worry, they’ll be safe! New to this year’s ‘Kids Dig it’ Medieval Family Fun Week. That is why we are introducing a new element of archery to our ‘Kids Dig It’ Medieval Family Fun Week in 2017. We are very excited to introduce XFire Games’ Archery Skirmish. Yes, its Skirmish, but with arrows!! Archery Skirmish is the latest in XFire Games’ Next Gen sports, lending itself to people who need to “feel” the true sense of a battle. So in the Spirt of all things experiential, we just had to have it! Appropriate for children aged from 12 and up, this high-adrenaline sport which helps encourage team work, hand/eye coordination, fitness and achievement is sure to be a winner! So tell your kids its out with the Sedentary Screen Time and in with the Bows and Arrows! XFire Games equipment is cutting edge when it comes to Archery Skirmish, the bows are strung to 30 pounds (no metric when it comes to the laws of Force with archery) so you know when you’ve been hit. But, guess what, you wont’ have the bruising like in paintball. The face masks not only look cool but keep your face out of reach from those pesky arrows. And the arrows, with their patent foam patent tip, are able to travel over a 35m distance with precision accuracy… so if you find yourself staring down the stems of an opponent’s arrow, get ready to move quickly! We know your kids are going to love this event, so book now! Introducing a new stallholder at the Festival this year, Lady Carberry! She’s joining one of the Festival favourites, The Peddlar, to bring custom-made medieval garments to you! She’s been making garments for over thirty years, and will be selling a range of items from jewellery, clothing and accessories, medieval-styled homewares and bric-a-brac. Lady Carberry has been making accessories, clothing, jewellery and homewares for over three decades and custom made medieval clothing for the last ten years, and has gained a reputation for detailed and high-quality workmanship. By using quality fabrics, trims and accessories in conjunction with consultations with each client, Lady Carberry creates beautiful garments which conjure the feelings and atmosphere of a bygone time. Her love of history, of tales of princesses and knights, began as a child, and she hasn’t lost the wonder that these tales bring. She learnt her skills for sewing from her seamstress mother who taught her the old fashioned way, and guided her through many creations. Being at the Abbey Medieval Festival brings together her two loves, and makes her feel at home, surrounded by so many history buffs and incredible garments. After her hobbit costumes were seen at the world premiere of The Hobbit (check out the photo with Elijah Wood! ), she’s been flooded with requests for custom clothing. And when they’re of such a high standard, who can be surprised! Lady Carberry will still have goodies on sale for you to purchase at the Festival and the Kid’s Day, so make sure to drop on in and have a peek at the skill and love she pours into each item! Check out http://www.facebook.com/LadyCarberryCreations or http://www.ladycarberrycreations.com/ to see more of what she’s done. If you’re seeking advice and wisdom on making your own outfit, she’s always available to help those in need! WE’VE JUST FINISHED our Kids’ Medieval Fun Day, and our volunteers are dragging off their medieval costumes, and cleaning up Abbeystowe. Everyone is exhausted, but all our volunteers are smiling, feeling really pleased that we have helped build a very special experience for so many children. The feeling of satisfaction you get from volunteering keeps many of us coming back and spending hour after hour, day after day, helping our community organisations. Here at the Abbey Museum and Abbey Medieval Festival, we are blessed with over two hundred volunteers. We want to make sure our volunteers are looked after, and have all the information and encouragement they need to keep on doing their wonderful job. That’s why we’ve run our Volunteer Induction days. It is one of the best ways to invest in our volunteers. To have a look at what we did at the last Volunteer Induction Day, have a look at the video footage taken on the day. See the video here for Volunteer Induction Day. If you are one of many new (and highly valued) volunteers, we hope you were able to make it. If so, can you sport yourself in the video. If not, have a look at it. We hope you can make the next one. In the meantime, we are now getting everything ready for the Abbey Medieval Tournament weekend. Please leave a comment so we can be sure you have viewed the video.